LAKEVILLE, IN. 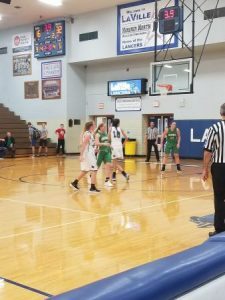 – Bremen used a half-court trapping defense to pull away from LaVille in a 60-26 decision in a non-conference high school girl’s basketball game at Cox Gymnasium. The Lancers scored five straight points to take an early 5-1 against the veteran Lions. Kelsey Aschenbrenner canned a 3-pointer and Lauren Dove added a field goal at the 5:42 mark. Bremen went on a mini 8-0 run to take a 9-5 lead before LaVille’s Trynitie Cox drained a trey to cut the margin to 9-8 with 1:42 remaining. Cox connected on another field with 24-seconds left in the first quarter to make it 15-10 before Bremen put in the half-court trap and pulled away. The Lions outscored LaVille 16-6 in the second stanza to take a 32-16 halftime lead. LaVille did not shy away from the more experienced Lions, making each drive inside the paint confidently. Cox finished with a team-high 10 points and hauled in 12 rebounds. Julia Hall added six points and three boards. “Our post players are getting better,” said Duncan. “We will continue working at driving hard to the rim and attacking the body. Following the game, Duncan took a few moments to reflect on Saturday’s loss at South Central and the contest against Bremen. The youthful Lancers battled on the boards, trailing only by five, and shot 44-percent from the field. Both improved areas from Saturday’s loss to South Central (Union Mills). LaVille (1-2) will play host to Class 1A, #6-ranked Oregon Davis (2-0) Friday, December 9. The varsity-only game will tip at 6:30 p.m. eastern. LaVille – Cox 10, Rock 0, Gonzalez 3, Aschenbrenner 5, Giles 0, Dove 2, Medors 0, Watts 0, Beehler 0, Hall 6, Tribbey 0. Totals: 10 4-6 26. 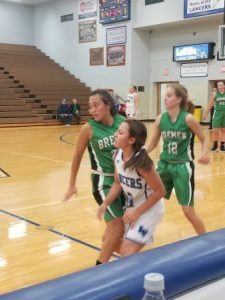 3-point field goals: Bremen 7 (Shively 2, Vermillion 2, Rodriguez 2, Foster), LaVille 2 (Cox, Aschenbrenner). Total fouls (fouled out): Bremen 11 (none), LaVille 12 (none) .